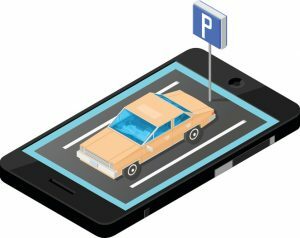 Home / Parking Matters Blog / Are Parking Apps the Future? Are Parking Apps the Future? While not quite in their infancy, parking apps aren’t a mature market. Yet. Yes, I think parking apps are the future but I am not sure the form we see today will survive. Let’s look at the challenges facing apps. First, they are expensive. Too expensive? Each operation must decide for itself but in a developed market where parking is near capacity, the app cost is hard to justify. Competition will eventually get the prices right. Today’s apps are a convenience but soon they will become a necessity and when that happens, prices are likely to drop as competition becomes fiercer. Second, apps mostly represent the e-commerce portion of the parking business and that portion is still relatively small. For apps to succeed and become indispensable, they need to penetrate all segments of the parking market. I think vehicle manufacturers understand this point and BMW’s acquisition of Parkmobile promises different and more integrated apps in the future. Third, and most importantly, app companies are reluctant to share data. If knowledge is power, the basis of knowledge in the early 21st century is data. App companies may be reluctant to share the data because they see it as a commodity and ownership is a competitive advantage. However, if apps become a necessity and they penetrate more deeply into the parking environment, facility owners and operators will be increasingly protective of their data commodity, demanding to keep any competitive advantage for themselves. It is important not to overstate the importance of apps but to see them as evolving. They are a developing line of products that’s likely to grow into something very different from what we see today. Interesting & valid points. My own observations are that apps will impact parking in a big way like every previous sector hit by digital disruption; mobile payments will increase along general trends, more data accessibility to decision-makers, and less intermediaries between parker and land owner. Everyone is reluctant to share as you say and I expect this will be interesting as to how things shake out. Yea, you’re right. The future is probably cash, forms and prox cards. People loves those way more than Uber.